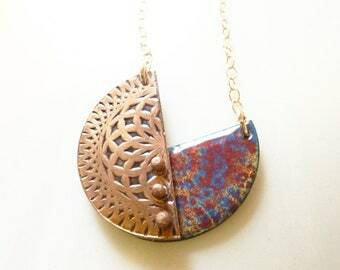 Both layers of this pendant are hand-cut from copper sheet. 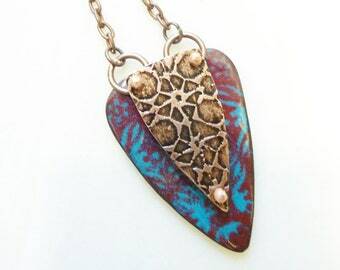 The top layer is embossed with a radial pattern and then oxidized to highlight the pattern. 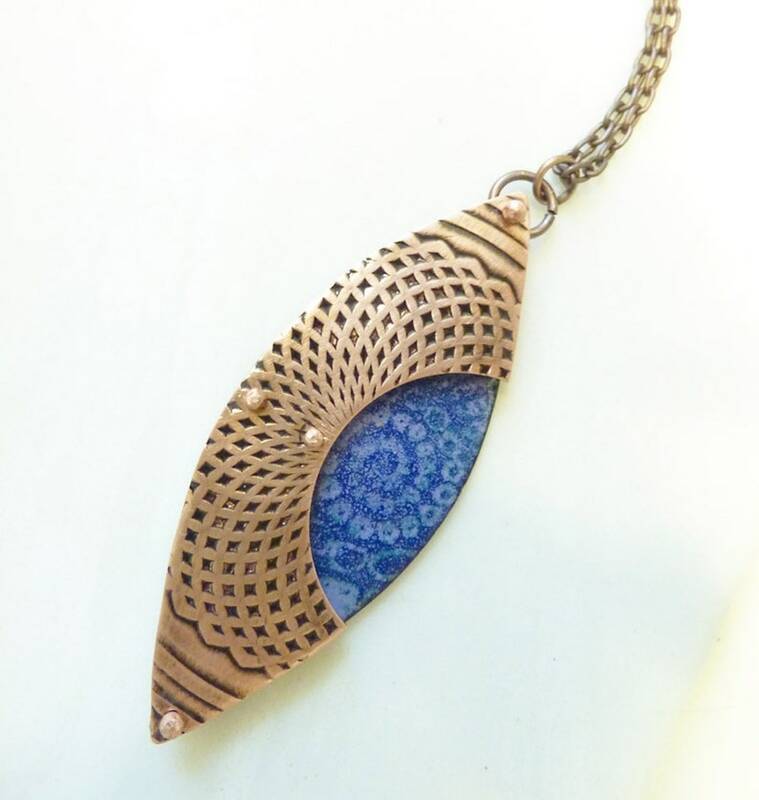 The bottom layer is hand-enameled on a copper base plate with a complementing circular motif in cobalt blue and periwinkle blue. 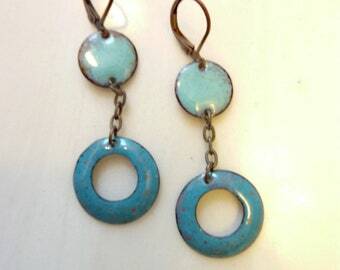 The top layer is then riveted atop tiny tubes over the enamel base for a 3-D effect. I've applied lacquer to the finished surface in order to protect the oxidization. 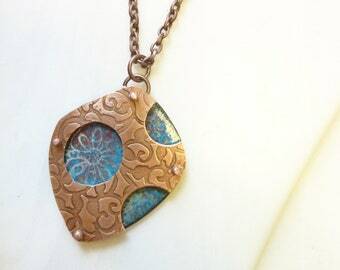 Each piece in the etched copper enamel series is one of a kind. 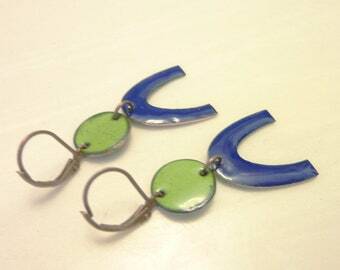 The copper shapes are carefully cleaned and prepared in order to accept the enamel. Then, I apply multiple layers of enamel, which is finely powdered glass. 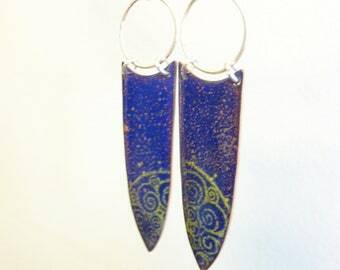 The layers of enamel are fused to the copper on both sides in a 1500 degree kiln. This firing process is repeated several times. Finally, the edges are sanded to expose the copper. 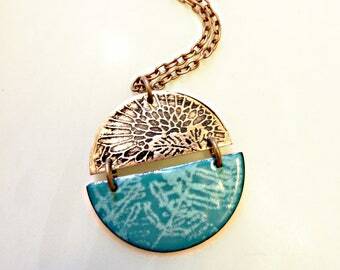 And voila .... a vibrantly colored enamel pendant which will make a great gift for yourself or a loved one. 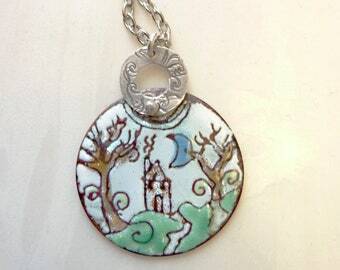 Pendant measures 2 3/4" long, 1" at its widest point, and 3mm deep. 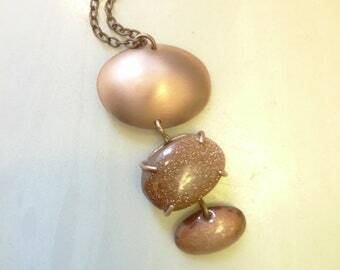 You may select either antique copper cable chain and lobster clasp, or 14k rose gold filled. Total length is 28". 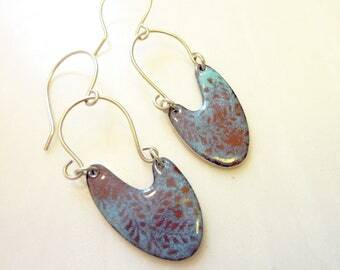 Perfect bronze earrings! Her work is beautiful, and she is a pleasure to buy from! My new earrings arrived quickly and beautifully packaged. They are spectacular and well made. I highly recommend this shop. Thank you! I love this bronze ring! Petfect fit, great texture. Very cute! Well made...my 3rd purchase...thanks so much!! Gemstones, crystals, and enamels (glass fused to metal) in your jewelry should be worn and handled with care. Like all stones and glass they vary in hardness and are at risk of being broken if hit or dropped on a hard surface. 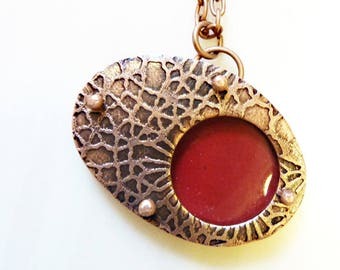 RedAvaDesigns is not responsible for stone breakage at the fault of the buyer.